Your real estate investor blog is one of the most powerful weapons in your real estate investor arsenal. When used correctly, your real estate investor blog can greatly affect your rankings in search engines. The higher you are in search rankings the more leads your site will produce. Keywords are the building blocks of every post. For your post to be great you need great keywords. To find great keywords you need an effective plan. In today’s post I want to share my battle tested formula that I use to generate competitive keywords for my real estate investor blog. I truly believe this to be something that every real estate investor can benefit from and it’s easy to do! Keywords in a blog post are specific terms that are being searched for. For example, when you type a search into Google, the results that populate are closely related to or exactly what you are looking for. Keywords aren’t normally one word. Keywords usually range from 3 to 5 words, like “sell my house” or “I buy houses”. You should always have a list of keywords to use for creating content on your real estate investor blog that appeal to different parts of your market. This will help Google determine your blog’s relevancy and help you get your site ranked and keep it ranked. The following parts of the post are all ways to find and filter through keywords. I use these methods in conjunction with one another to find a mix of unique keywords and high traffic keywords. To begin your search for the best keywords for your real estate investor blog you need to identify your market. Although most of you reading this are already somehow involved in real estate investing, I still want to cover effective ways to clearly define your market for any beginners. Start with a pen and paper and in the center write what it is that you want to accomplish. This could be something like “buy fix sell” “buy fix hold” or “Wholesale”. This is the most important part of this “mind mapping” process. Next, draw a circle around it and draw three or four branches coming off of it. At the end of each branch write the first thoughts that you have when you think of the phrase in the middle of the page. I’ll use my “mind map” for wholesaling as an example. The word “wholesaler” was in the middle of my page. The phrases “investors” “fast closing” and “fast sale” were what I wrote on my branches. This means that the keywords I use will need to appeal to investors looking to buy properties quickly and motivated sellers who need to be rid of their properties. This portion should help you generate a couple of 3 to 5 word high traffic keywords for your real estate investor blog based off of the branches of your mind map. By high traffic I mean the keywords that most people search for like “sell my house fast” and “I buy houses”. This also makes them the most competitive keywords. Keep them handy along with the phrase you circled in the middle of the page. You’ll need them for the next step. For a digital mind map creator click here! Forums are a great way to find keywords that other real estate investors won’t think to use. This means you’ll be able to capitalize on the amount of traffic these words bring in as well as the lack of competition. The results that populate should be forums and discussions on home improvement. Click on one of the top results and peek inside. Congratulations! You’ve just opened up a treasure chest filled to the top with gold, and it’s all yours! When you take a look at the way a forum is laid out you’ll notice it is subdivided, either by categories or discussion titles. These categories and titles make for excellent keywords. There is an almost unlimited amount and almost all of them would be great topics of discussion in a real estate investor blog post. To choose keywords with the best chance of gaining traffic, choose the categories or discussions that have the most activity going on. Create lists of short tail (3 words) and long tail (5 words) keywords. Wikipedia can be used much like the forums. Start by heading over to the Wikipedia home page and click into the search box. Type in any one of the keywords that you’ve already collected and click on one of the results. Now, look at the links in blue on the page. You’ll notice that most of them are closely related to your topic or keyword. Wikipedia creates links to resources that could be helpful to you. 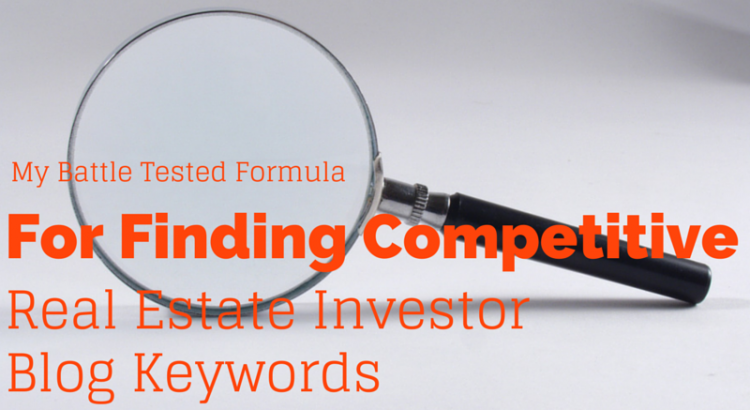 These work great as keywords for real estate investor blogs. Wikipedia has already established that they are relevant to your main keyword and one of Google’s top five ranking factors is relevancy. They even highlighted them for you! Take keywords that you got from your mind map and you forum search and put them through Wikipedia. If you have access to Google AdWords it is an awesome tool for generating keywords and related keywords. While the previous two methods create unique less competitive keywords, AdWords generates keywords based on traffic and relevancy. Fill out the form with your information and watch the magic happen! You can use this tool to produce keywords that are more competitive, but get higher traffic. Start your search by using the keywords you came up with in your mind map. These will be your general keywords. If you really want to give your real estate investor blog the best chance to help your site, plug your unique keywords into the AdWords tool. You are taking something unique and using a great tool to create even more unique keywords! If this post is followed from start to finish, there is no reason why you should ever have a shortage of keywords for your real estate investor blog. Not only will you not have a shortage of keywords that will help you get your site ranked, you’ll have gotten your site ranked the right way. Using this tactic will save you from pouring time and money into services that can’t get you the lasting results that a well-managed blog can. Take advantage of this post and find those keywords that are going to set your site apart from the rest! Feel free to post links to your blogs, share your successes and leave comments below! I always enjoy interacting with my readers and always love reading about other’s success.